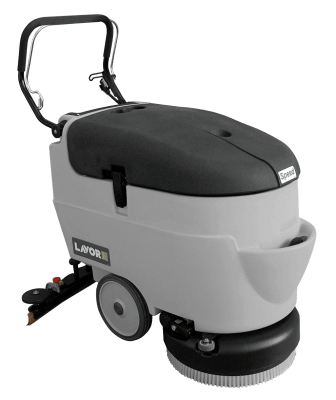 The Speed series scrubber driers are compact and manoeuvrable with high performance cleaning to help clean areas easily. Exclusive squeegee system assures high performance at low cost, the unique design helps achieve excellent drying results even on difficult surfaces. Designed for quick cleaning of premises of small and medium area. Ideal for deep cleaning and washing floors in stores and warehouses, shopping centers, gyms, schools and public buildings, art galleries and concert halls, office buildings, industrial buildings, service stations. Includes battery and charger. Suitable to work in congested areas like wellness centres and medical environments in general, gyms, retail outlets, car shops, sales points and health care. Chemical dosing system on request. User friendly analogic control panel. Control lever for brush operation and detergent water out?ow. Thermal circuit breaker to protect vacuum and brush motor, battery level indicator, hour meter (optional). Automatic detergent dosing system on request. Indicator of clean water tank level. Easy access to recovery water tank with visual inspection. Extremely silent (62 dB) thanks to the particular housing of the vacuum motor and the use of soundproo?ng material. Thanks to the special squeegee support it is easily possible to the tilting of the machine to carry out the drying of the ?oor without scrubbing. The oversize wheels facilitate maneuverability and effortless use.